Snails are host to a wide range of parasites, especially parasitic flukes that turn snails into clone factories to pump out streams of parasite larvae. But there are species of snails which are parasites themselves, and many of them are parasites of echinoderms - the phylum of animal which includes the likes of seastars, sea urchins, and sea cucumbers. Most molluscs have a rasping organ call a radula which they use while feeding to scrape away at their food. In the vampire snail this has been modified into something like a syringe which they can use to stab into a fish to drink their blood. In predatory whelks, the radula is used like a file to rasp away at the hard shell of their prey (usually another mollusc) to access the soft, gooey centre. But that is not how S. troglodytes feed on its sea urchin host. 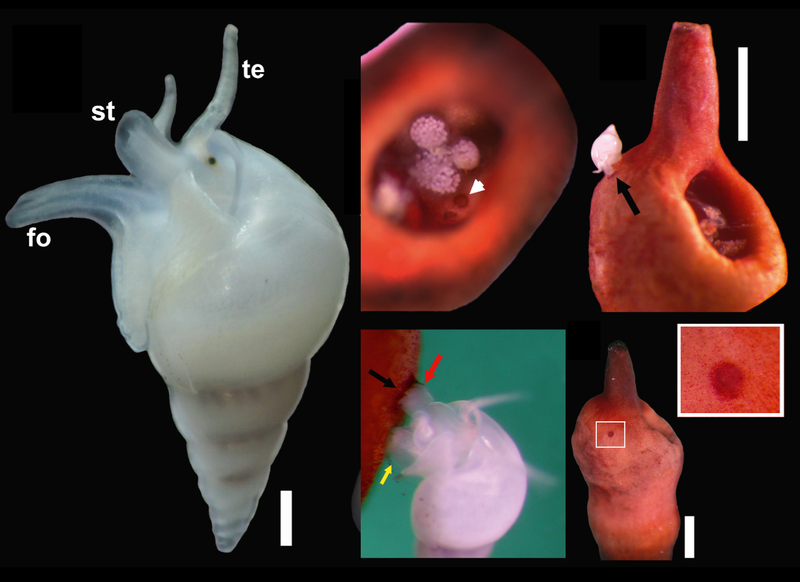 Unlike most of its gastropod relatives, S. troglodyte has lost its radula - so how can it bore into the spine of a sea urchin to reach its tasty core? Based on their observations, the researchers who conducted this study concluded S. troglodyte is secreting some kind of corrosive substance to eat through the tough walls of the spine in order to gain access to all that soft internal spine tissue. But this parasitic snail is not content to simply just feed on the sea urchin, they also alter the urchin's spines to make it a more comfortable home. Sabinella troglodytes is one of many species of gall-forming snails that parasitise echinoderms. As their name indicates, the slate pencil urchin is covered in straight, pencil-shaped spines - but the spines housing S. troglodytes look almost like fattened tubers. Much like how gall-wasps can induce bulbous growths on their host trees, these gall-forming snails can cause growth abnormalities in the sea urchin's tissue. This is also somewhat comparable to Accacoelium contortum, a parasitic fluke that lives on the gills of ocean sunfish while wrapped in a cosy little flesh bag made out of the host's tissue. It is currently unknown how S. troglodytes alters the sea urchin's spines, but it could be due to some other components in the snail's saliva - in addition to corrosive agent to erode the sea urchin's spine, it might also be spitting out growth factors that alters the tissue of the spine. In addition to being a cosy place to feed and hide from threats, these galls seem to be a bit of a love nest for S. troglodytes during the summer months. The researchers noted that between December and February, almost all the galls were mostly occupied by snail couples (consisting of a female and her smaller male mate) which have settled down to raise a brood of eggs. But for the rest of the year, the galls were filled with juvenile snails which had probably inherited the gall from their parents. While the spines of many sea urchins are straight and narrow, they are not immune to tampering by the right parasite. Sabinella troglodytes shows that with a little biological renovation, one can turn even something like a sea urchin's spine into a cosy home suitable for raising a healthy brood. The gall-former Sabinella troglodytes (caenogastropoda: Eulimidae) and its association with Eucidaris tribuloides (Echinodermata: Echinoidea). Journal of Conchology 42: 371-377.